Interested researchers from around the world can request access using this simple online form, and there will be an introductory webinar for new users on October 23, 2018 at 12:00pm EST (5:00pm BST). To participate in the webinar, please register by October 22nd. 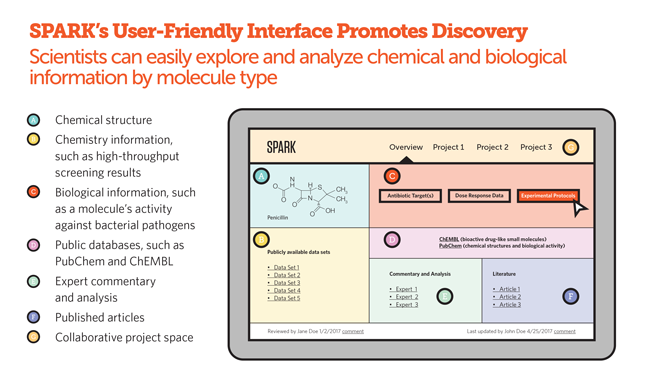 ACS Viewpoint article, Shared Platform for Antibiotic Research and Knowledge: A Collaborative Tool to SPARK Antibiotic Discovery, authored by Joe Thomas, Marc Navre, Aileen Rubio and Allan Coukell.